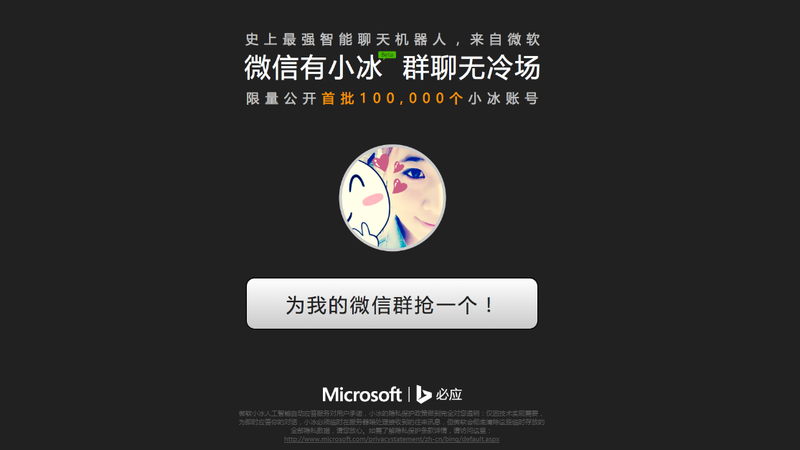 Four days ago, Microsoft China released a Bing branded AI chat bot Xiaobing. Initially, the Bing chat bot was exclusively available in Tencent’s WeChat, the most popular mobile messaging app in China. But since yesterday, Tencent immediately banned all Xiaobing’s conversations because of privacy and security concerns. The good news is that Microsoft is trying to make the chat bot lives again, along with the near finished 2nd generation of Bing chat bot. Bing chat bot Xiaobing, which means “little Bing” in Chinese, is developed by the team inside Microsoft Asia-Pacific R&D Group. The team was formed by Microsoft online services, search and ads experts. Their research and tech have been contributed to Microsoft online services for years. Technically, we can think of Xiaobing as Cortana’s sister. Since the core technologies behind the Bing chat bot, including knowledge repository, big data, natural semantic analysis, machine learning, are same as the ones behind Microsoft personal assistant Cortana. Xiaobing can also learn personality features from millions of Chinese netizens. At the launch event, the famous Chinese traditional crosstalk master Yu Qian accepted Xiaobing as his apprentice. They had a witty conversation as the demo. The celebrity effect boosted Xiaobing’s spread over the Internet and social networks. Xiaobing reached over 100 thousand users and was added to 1.5 million groups soon after the announcement. In addition to witty chat, Xiaobing also brings reminder, search, weather, horoscopes, travel, entertainment, food and drinks info to users. Before Cortana launches in China, Xiaobing was a natural way to experience Microsoft’s AI technologies. Microsoft could also dig deep into the big data of Chinese netizens based on the huge usage of WeChat.